From the time he was a puppy he was full of heart and love for all things. 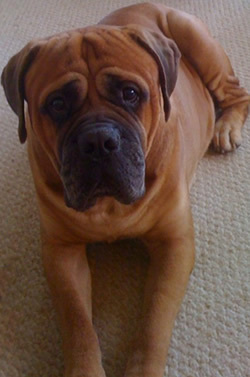 He was a big 150lb dog with a heart as big as his body. He was never aggressive towards anything and full of life. And everywhere I went with him, people would stop to ask if he was friendly and want to pet him. He loved every minute of it. Never jumping he would come around and sit alongside you, and lean into you with his body to show that he liked you. He never knew that he was big or that he had any effect on people he met. 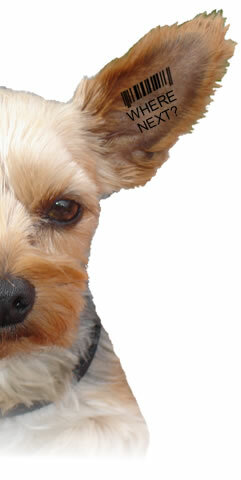 And the tail, it was always gently wagging wherever he saw people or other dogs. Kind, affectionate, loyal and always gentle towards people. From the time I first got him I saw that he was different from other dogs I owned. He was the dog that every boy dreams about who would follow you anywhere and stare at you in quiet solitude with those big eyes. He would look at you and it seemed like he knew what you were thinking. He was one of those special dogs. This was the one dog that doesn’t come along very often. For five years he gave me tremendous love and devotion. Even the last year of his life, which was filled with the growth of the tumor on his back between his shoulder blades. At the time it was happening I thought the tumor was serious. The connection with the microchip did not occur to me. Unbeknownst to us, he was chipped before we got him. And at a local Humane Clinic, at about 2 years of age, I had him chipped. This was done without the clinic ever checking him for existing chips. Even the (2) vets that saw him, through all this, never mentioned the possibility that the chipping might be the possible cause. Two weeks after he was gone in late February 2010, one night, I did a web search on “cancer/dogs”. I started reading articles on tumors at the site of chips. 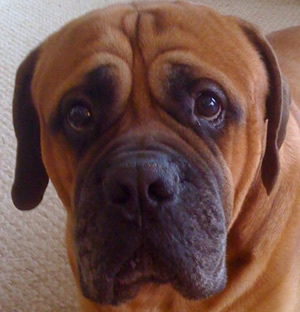 And then I remembered the comment from the vet after the tumor was removed in September 2009, “Did you know Seamus had 2 micro chips?” Both my wife and I both heard him say it. We never saw it as a concern and the vet did not mention it as the cause of the tumor after the surgery in September 2009. Three months before the tumor was removed, we had the vet take an X-ray of the tumor. We wanted to see the extent of the mass and the size. It was growing rapidly from all appearances. 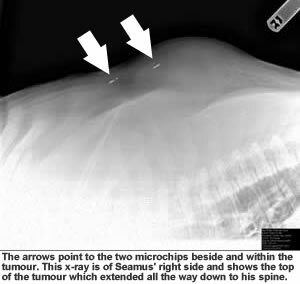 The X-ray taken three months before the surgery clearly shows the tumor surrounding the micro chips. However, we were not looking at micro chips we were looking at the size of the tumor. The vet should have made the connection between the micro chips and the tumor. Why would one chip be in the center and the other one on the side of the tumor? By September 2009, it was so large we had to remove it even if he did not pull through the surgery. It weighed 4lbs 3ozs. The tumor returned with a vengeance in December and January 2010. He lost the battle on February 4, 2010. He could go on no longer. The picture you see was taken about four weeks before he died. I took the picture because I knew he would not be around much longer. He was having difficulty getting around and he was getting medication for pain and the other organs that were being affected by the cancer. I knew the end was near. My wife and I were both prepared for it. Yet I wanted to remember him as he was when he was healthy. In the picture you cannot see the reappeared tumor which is just behind his head. Now that he is gone I sometimes wish I had taken a picture of the reappeared tumor so the whole world could see the reappeared chip induced tumor on his back. The memory of him struggling daily and watching that tumor grow daily will live with me forever. It broke my heart and I wish that no person ever watches their pet develop one of these tumors. He was certainly in greater pain than I, but never whimpered or cried during any of this. It is difficult to write about Seamus' suffering but I do so in the hope that no other pets should suffer the same fate. His struggle to live is never far from my memory. I miss him every day.